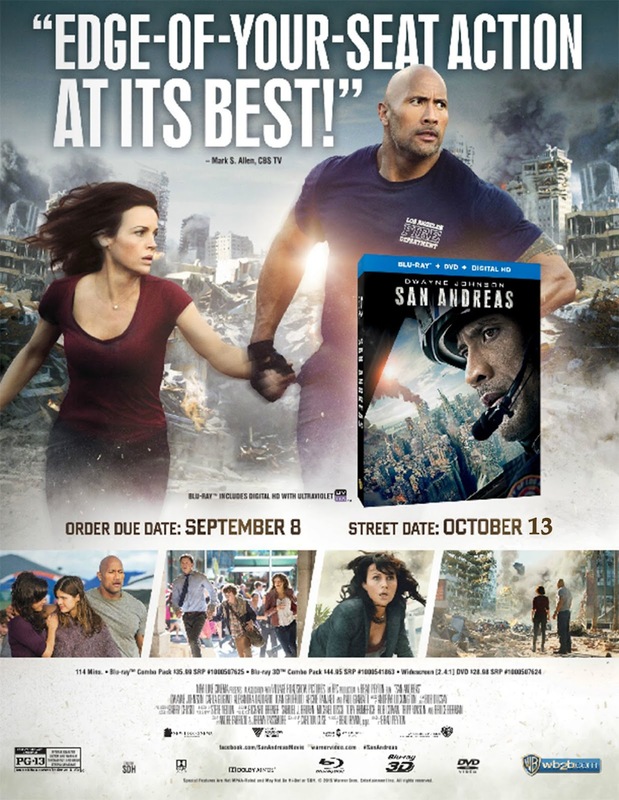 Update … Warner Bros. Home Entertainment has moved San Andreas from Oct. 20 to Oct. 13. Previously we report: Like a massive zipper running from the Sea of Cortez to San Francisco (and out into the Pacific Ocean) and poised — at any moment — to unzip San Diego, Los Angeles and all points west and south of Hollister from the rest of the North American Continent is the dreaded San Andreas Fault. And just as certain, they will love San Andreas once again on Oct. 20 Oct. 13 when Warner Bros. Home Entertainment shakes up the home entertainment marketplace with a three SKU helping of this action flick starring Dwayne Johnson — there will be a stand-alone DVD double-disc edition and two Blu-ray/DVD Combo Pack editions (one with and one without a 3D viewing option) ready at retail for fans to shake their booty to. For the record, the ARR for the new Oct. 13 release date is now 137 days and the latest box office take is $151.9 million. 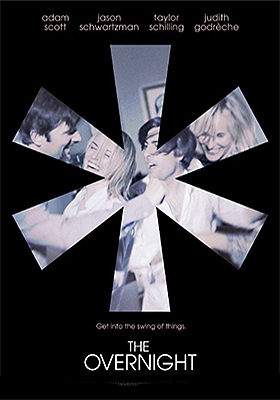 Paramount Home Media Distribution has selected Sept. 15 as the street date for the DVD debut of writer/director Patrick Brice’s surprise Sundance Film Festival hit comedy, The Overnight. After bouncing out of Sundance last January with all sorts of positive critical buzz, The Overnight began working the festival circuit and then finished with a limited theatrical break in June — The Orchard handled the major metro run — now Paramount has scooped it up for the home entertainment market place. For the record, ticket sales were right at $1 million and the ARR is a swift-to-market 88 days. Words like “awkward,” “weird” and “strange” are often associated with both filmgoer comments and critic’s reviews. Whether professional or just theatre patrons, the agreement is almost universal. The Overnight is one strange — and we might add, briskly-paced — comedy! Alex (Adam Scott — as Ben in the Parks and Recreation comedy series, plus such films as The Secret Life of Walter Mitty, Stepbrothers, etc.) and Emily (Taylor Schilling — as Piper in Orange is the New Black, plus such films as Argo, Atlas Shrugged: Part I, Dark Matter) are thirty-something yuppies (or whatever they are calling them these days — Millennials???) that have just moved to Los Angeles with their young son and are exploring their new neighborhood when they bump into Kurt (Jason Schwartzman — The Grand Budapest Hotel, Saving Mr. Banks, Rushmore) and his son at the park. The kids hit it off and Kurt, who seems to know no boundaries, invites the couple over for dinner at his place. How to you say no to someone who will not take no for an answer? This is a comedy — a strange, weird and awkward comedy — but if you didn’t know any better, our boy Kurt could just as easily be a serial killer. Since he won’t take no for an answer, Alex and Emily have little choice but to accept his invitation. Later they arrive at his place and are introduced to his wife, Charlotte (Judith Godrèche) and things seem to be going fairly well — as normal as could be expected from a host such as Kurt. But the night is young … and things progress to the strange side after Kurt and Charlotte suggest that the boys be put to bed, while Alex and Emily stick around for some after dinner activities! Also on getting a Sept. 15 release date is an ode to all things Abby Sciuto! For those in the know, that’s Pauley Perrette’s long-standing character on NCIS: Naval Criminal Investigative Service. Paramount has a three-disc DVD collection titled NCIS: Naval Criminal Investigative Service - The Best of Abby ready for fans to enjoy on that date. Indican Pictures has circled July 28 on the calendar as the DVD debut date for director Kirk Loudon’s award-winning supernatural horror thriller, Dawn of the Crescent Moon. 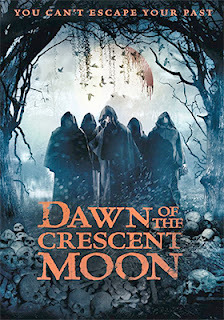 A word of advice, if you are heading out to some remote Texas location (Dawn of the Crescent Moon was filmed in and around Fayetteville, Texas) to research a centuries-old massacre as the focus of an assignment for your Myths and Legends class, make sure you know all the members of your group before departing. This is especially true if one of the members of your little camp-out group can channel the dead! It all revolves around the “Legend of Blood Lake,” which is the catalyst for the assembly of this particular “victim pool” … that would be a quintet of attractive college students, who are joined by an equally attractive townie named Dawn (Shiree Nelson — Apart, Love Land), who is more than eager to help them with their research. We know early on that it is not safe and that comes from the local barkeep, Cyrus (played by veteran character actor Barry Corbin — Urban Cowboy, WarGames, etc. ), who speaks of the legend and gives them fair warning that camping out there at Blood Lake may not be a great idea. So off they go, Michael (Kurt Cole — Up&Down), the gorgeous Lanie (Lauren Leal — The Legend of DarkHorse County, Haunted Trailer), Penn (Johnny Walter — Love Land) and Nick (Edward Hong — Blood Lines) — frat boy and nerd bomber respectively — the mysterious Mara (Brooke Coleman — Welcome to Happy Valley) and their new best friend Dawn. They pitch their tents and gather around the campfire for a little chit-chat and everything goes down hill from there. It seems that Mara sees the spirits of the dead, which are with the assembled group, but when the subject of the slaughter of a Comanche tribe (the roots of the Blood Lake legend) is broached, all hell breaks loose. Something is creepy and not quite right about this gathering of six in the woods. Is it Mara, the “I see dead people” blonde — is she really a college student? Or what of Dawn, she is a stranger and why is she so helpful? Or perhaps, it is one of the other four who might just have a secret that the spirits of this horrific legend will expose. You can count on one thing, not everyone will be passing this Myths and Legends assignment!!! Wild Eye Releasing announced two new additions to its DVD release calendar for the fall of this year. For genre fans it is all good news … very good news, so let’s get to it! There’s that memorable sequence in Pulp Fiction with Bruce Willis and Ving Rhames involving a pawn shop and some inbreds that was, well, unique. Thoughts of murder and revenge quickly took a backseat when Willis and Rhames were captured by Maynard (Duane Whitaker) and Zed (Peter Greene), who were (that is past tense of course) about as sick as they come. Whether writer/director David Zagorski was inspired by the spider and fly twist served up in Pulp Fiction or not, he has gone that film one better with his 2012 indie slasher/horror flick, Killing Brooke. This little gem is due out DVD this coming Sept. 29 from Wild Eye Releasing, with sales and distribution support provided by MVD Entertainment Group. From a teaser prologue we know that Vance (Colin Allen — The Devil’s Nightmare, The God Question) is a serial killer, but that’s just some early misdirection on the part of filmmaker David Zagorski. That bit of information sets up the tension when lesbian honeymooners, Brooke (Alex Fandel) and Chloe (Dina Baker — The Devil’s Nightmare) pick him up in a bar for a little three-way action. It seems certain that he’s going to have his way with them and then do what serial killers do. And sure enough, he slices up Chloe and sends the terrified Brooke scurrying off into the spooky woods. And just when you think this is going be some riff on The Most Dangerous Game — a hunter-and-hunted story — Killing Brooke makes a sharp Pulp Fiction turn. 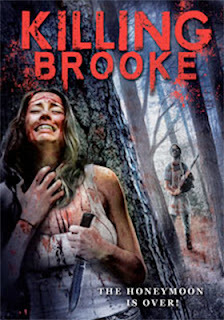 Brooke is going to be chopped up into little pieces by Vance, but then she is miraculously rescued by the Spade family. Dagget (Ray Hryb) and his wife Darla (Kt Baldassaro) — who just happens to be about the nicest little homemaker you could ever imagine — save her from being murdered. They even knock Vance loopy and make him their prisoner. Brooke is saved!!! If Bruce Willis thought that he was saved from Ving Rhames when he stumbled into that pawn shop, then you have some idea about Brooke’s fate. The Spades are “spiders” and they have not one, but two tasty “flies” to feast on. Bonus features include a blooper reel, a behind-the-scenes featurette and commentary from filmmaker David Zagorski. Shifting to Oct. 27 — and just in time for Halloween — is actor/writer/director Dave Campfield’s Caesar and Otto's Paranormal Halloween, which is nothing short of a Scream Queen film delight — delivered tongue firmly planted in cheek! Any film that has Tiffany Shepis, Debbie Rochon, Monique Dupree and Brinke Stevens in it is, by definition, a must-see … genre fans need no introduction to these beauties. And, this is not the first rodeo for Caesar (Dave Campbell) and Otto (Paul Chomicki) either — Caesar and Otto's Summer Camp Massacre (2009), Caesar and Otto's Deadly Xmas (2012) and more; it’s a regular indie film franchise series and the aforementioned Scream Queen’s participation speaks volumes as to just how much fun everyone is having! You need filmmakers such as Campbell and Chomicki to come along from time to time to let a little air out of the indie horror scene — and big budget films for that matter — from time to time. This is for fun and everyone here is having a grand time. 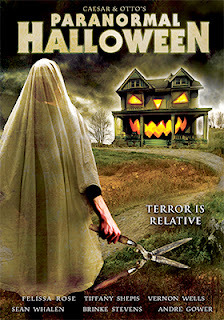 Bonus features include two commentary options — one with Campbell and Chomicki and one with members of the cast — a booper reel, bonus short films (not all specified at this time), but for sure, The Son of Piggyzilla Trilogy and the Robert Z'Dar Tribute short film (dedicated to the late Robert J. Zdarsky of Maniac Cop fame). 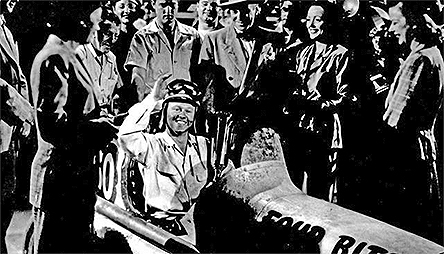 The Film Detective announced its next wave of 50 film restorations that will be heading to DVD. The street date for this next group of priced-to-collect film treasures is Aug. 4!!! Let’s get right to … there is a lot to cover here! Beginning with a pair terrific film noir gems, we have both director Tay Garnett’s 1951 film release of Cause for Alarm, starring Loretta Young as a wife wrongly accused of plotting her deranged husband’s murder (played by Barry Sullivan), and director Edgar G. Ulmer’s 1945 “Poverty Row” (Producers Releasing Corporation) film noir masterpiece, Detour, teaming Tom Neal with Ann Savage. Other films in the mix with a dramatic edge are writer/director Frank R. Strayer’s summer of 1933 “provocative” drama, By Appointment Only (Sally O’Neill and Lew Cody star in what only can be described as an awkward relationship); Behind Office Doors (1931, Mary Astory, Robert Ames and Richardo Cortez); director Felix Feist’s Cold War biopic, Guilty of Treason, starring Charles Bickford as Cardinal Joszef Mindszenty (with Bonita Granville and Paul Kelly) and the late Mickey Rooney stars in director Edward Ludwig’s 1949 film release of The Big Wheel (Mary Hatcher, Thomas Mitchell and Spring Byington co-star). Mickey Rooney also stars in director William Nigh’s 1937 film, Hoosier Schoolboy — opposite Anne Nagel — and Bette Davis stars with Pat O'Brien in writer/director Howard Higgin’s 1932 social drama, Hell’s House. 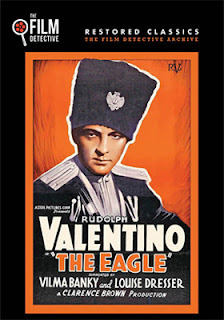 Another delight in this mix is August Week-End, the rare-to-find 1936 film from director Charles Lamont. Valerie Hobson (The Bride of Frankenstein, Werewolf of London, etc.) 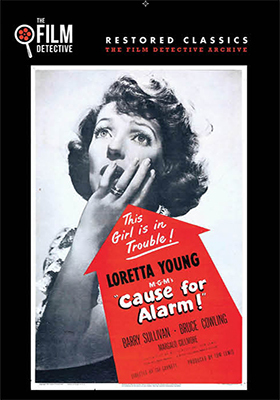 stars as Claire, the beauty who becomes the focus of attention at a family gathering when powerful attorney George Washburne (Paul Harvey) tries to bribe her boyfriend (G. P. Huntley) into marrying his daughter so that he can have the young woman for himself! 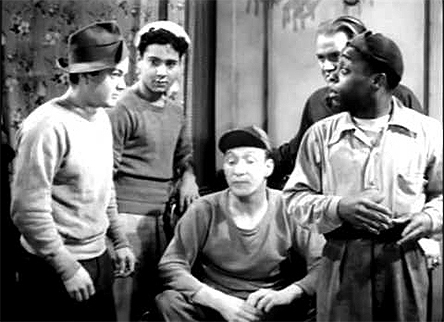 There are four films from the Film Detective on the Aug. 4 release calendar that showcase the antics of the East Side Kids — Leo Gorcey and Huntz Hall, plus Bobby Jordan, Gabriel Dell and Billy Halop (among others) — these are: East Side Kids (1940), Boys of the City (also 1940), Bowery Blitzkrieg (1941) and Ghosts on the Loose (1943). Westerns? 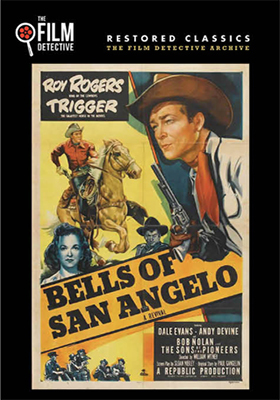 If you enjoy Westerns, Aug. 4 brings fans the likes of Roy Rogers, Dale Evans and Andy Devine starring in director William Witney’s 1947 film release of Bells of San Angelo, the all-star Abilene Town (1946) featuring Randolph Scott, Ann Dvorak, Rhonda Fleming, Lloyd Bridges and Edgar Buchanan and director Sam Newfield’s 1941 oater, Billy the Kid Wanted, stars Buster (Flash Gordon) Crabbe as the legendary Billy the Kid … others familiar faces in the cast are Fuzzy St. John, Dave O’Brien, Slim Whitaker and Charles King. Comedy? How about comedy legends Abbott and Costello in Africa Screams? Or how about Shelley Winters, Farley Granger and William Demarest in writer/director George Beck’s 1951 hit, Behave Yourself!? They are both here, plus such fun-filled films as The Bashful Bachelor (1942, with Chester Lauck, Norris Goff and Zasu Pitts), It's a Joke, Son (1947, Una Merkel, Kenny Delmar and June Lockhart), Check and Double Check (1930, Amos and Andy) and the 1938 gold-digger comedy, The Rage of Paris, teaming Douglas Fairbanks Jr. with Danielle Darrieux. The Film Detective has prepared eight film restorations from the silent era for release as new DVD product offerings on Aug. 4. These are: a real early silent rarity, Florida Enchantment (silent-1914), D.W. Griffith’s Intolerance (silent-1916), Betsy Ross (silent-1917), Erich von Stroheim’s Blind Husbands (silent-1919), Mary The Hoodlum (silent-1919), Lon Chaney is Quasimodo and Patsy Ruth Miller stars as Esmeralda in The Hunchback of Notre Dame (silent-1923), The Eagle teams Rudolph Valentino with Vilma Bánky (silent-1925) and director Allan Dwan’s The Iron Mask (silent-1929, with sound effects), starring Douglas Fairbanks. And you can’t have a selection of 50 new film restorations without at least a couple of classic horror films. Not to worry, director Ray Kellogg’s 1959 The Giant Gila Monster is here, as is director Allan Dawn’s The Gorilla, starring Lionell Atwill, Bela Lugosi and The Ritz Brothers. For a complete listing of the Film Detective’s Aug. 4 DVD releases check out page 7 in this week’s edition of the DVD & Blu-ray Release Report or check out the company’s website at www.thefilmdetective.com. Warner Bros. Home Entertainment doubled-back this week with a surprise Sept. 1 street-date for George Miller’s long-awaited reboot of the Mad Max series, Mad Max: Fury Road. This will be a three-SKU product offering — the traditional DVD (a double-disc affair) and Blu-ray/DVD Combo Pack configurations, plus a 3D/2D Blu-ray/DVD Combo Pack edition. The ARR is 109 days and domestic ticket sales were a robust $151 million. With San Andreas getting an Oct. 20 release date last week, it appeared certain that this Tom Hardy and Charlize Theron all-action thriller would also be given an October release window as well, but sharp eyes over at Warner Bros. must have spotted that wide open street-date Tuesday on the first of September and jumped all over it. Whatever street date given to Mad Max: Fury Road — either before or after Labor Day — will be just fine for fans eager to crank up the volume and enjoy the wasteland action. The so-called “Hollywood” studios had nothing in the way of new hit theatrical releases (those films grossing in excess of $25 million) planned for Aug. 18, Aug. 25 or Sept. 1, which is exceedingly rare to go so many street-date Tuesdays in a row without something to stir action at retail. This solves at least one of those release window vacancies — indeed, during this entire three week period there is only one other film set for DVD and Blu-ray that has generated ticket sales in excess of $10 million (Sony Pictures Home Entertainment’s Aloha on Aug. 25, which rides home with $21 million at the box office). Back in 1981, filmmaker George Miller released The Road Warrior, starring Mel Gibson, which was a monster hit that delivered some of the best action scenes ever put to film — the finale was a stunner! In 1985, we got Mad Max Beyond Thunderdome, which was a huge disappointment … a franchise killer! After 30 years, Miller finally returned to the energy of The Road Warrior and took the best of that film and extended throughout Mad Max: Fury Road, basically The Road Warrior on steroids. It did not disappoint … and the ending left it open for further adventures. The two Blu-ray SKUs include UltraViolet. Tabbed for Sept. 29 is writer/director Doug Ellin’s Entourage. The ARR for that street date comes in at 116 days and the box office take was a lackluster $32.2 million. Warner Bros. Home Entertainment will be making available a DVD edition as well as a Blu-ray/DVD Combo Pack SKU (with UltraViolet), with all of the bonus goodies exclusive to the latter (save deleted scenes, which will be common to both). 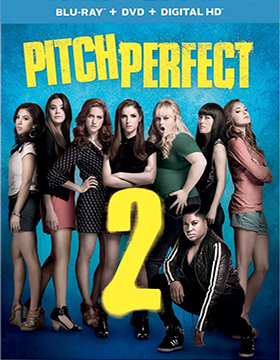 Summer blockbusters don’t all have to be loud and CGI-enthused — it’s called counter-programming — and that’s exactly what Universal Studios Home Entertainment has with actor-turned producer/director Elizabeth Banks’ Pitch Perfect 2. With $183.4 million (and still counting), this musical comedy is not just a sequel, but the second leg in what is clearly a franchise series (summer of 2017 for round three). Sept. 22 is the street date that Universal has assigned for DVD and Blu-ray/DVD Combo Pack editions of Pitch Perfect 2. The ARR is 130 days. 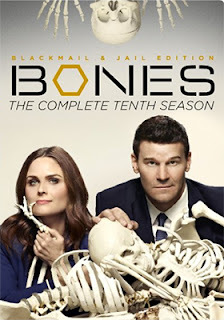 20th Century-Fox Home Entertainment has added Bones: The Complete Tenth Season (a four disc collection) to its already busy September release calendar … the street date given this milestone collection (all 22 episodes, including the 200th case in this venerable series) is Sept. 29. Another TV series announcement made this week was for Blu-ray and DVD collections of Sleepy Hollow: Season Two, which will be retail-ready on Sept. 15. 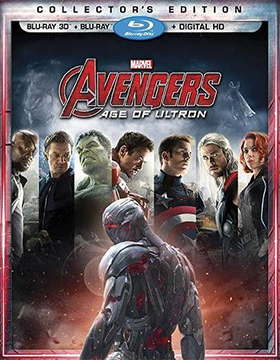 Walt Disney Studios Home Entertainment has apparently decided that a Friday in early October is the best time to street stand-alone DVD and Blu-ray editions, plus a double-disc Blu-ray SKU — with both 2D and 3D viewing options — of director Joss Whedon’s mega-Marvel hit, Avengers: Age of Ultron. With $456 million in domestic ticket sales, Disney can pretty much pick any street date it desires, with the sole exception of any release window that Universal Studios Home Entertainment selects for the even bigger monster, Jurassic World ($611.2 million and counting). As to bonus features, there is a making-of featurette common to all SKUs. The two Blu-ray editions include additional extras — unspecified commentary (participants not available at press time), a gag reel (seems appropriate), “Making-of Featurettes” (again, details not available) and “Never-Before-Seen Deleted Scenes” (that makes sense, especially if you saw the film theatrically, deleted scenes wouldn’t be there). 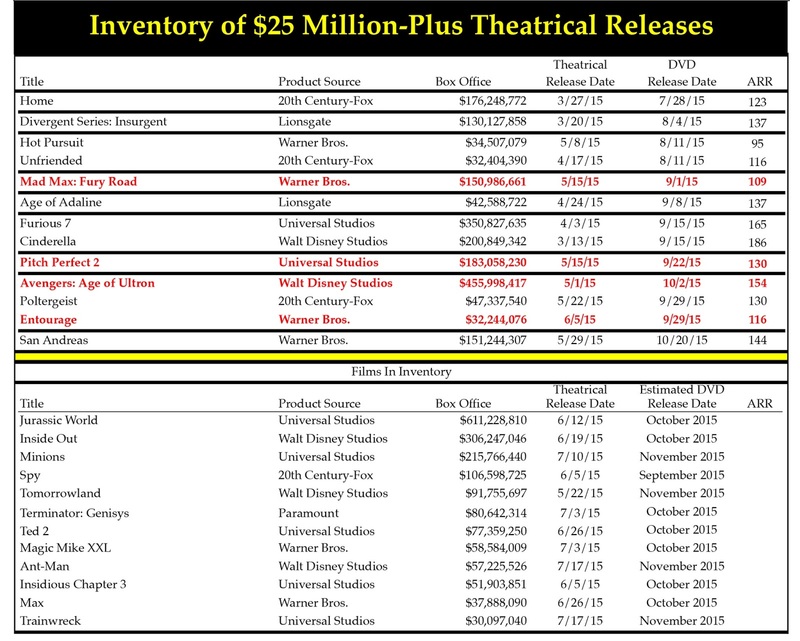 This past week was a busy one for announcements related to new theatrical releases with domestic box office revenues in excess of $25 million that are destined for the home entertainment market place. * ARR is the Asset Rollover Rate for film as measured in the number of days between a film's initial theatrical debut and its subsequent release as DVD and Blu-ray product offerings.